Fuel injector cleaner is an easy way to improve the performance and fuel economy of your vehicle. With this guide, we’re going to go over the best fuel injector cleaners you should buy and the top 5 cleaners we recommend the most. NOTE: Doing any type of fuel injection cleaning, requires repetition. Before we show you the best-rated fuel injector cleaners to buy, you have to understand that (depending on your engine’s internal condition) it will require repeated cycles of any given cleaner to remove all gunk, varnish, and carbon deposits. This is especially true if your vehicle has been under heavy use. What is Fuel Injector Cleaner? These days, nearly all vehicles are fuel-injected. That means, instead of using a carburetor to get gasoline to your engine, small electronically-controlled valves, called fuel injectors, do the job. The problem is, fuel injectors can become clogged over time. Eventually, this leads to rough running, poor performance and decreased gas mileage. That’s where fuel injector cleaner comes in. The cleaner is chemical concoction that’s added to the gas tank. It flows through your fuel system to the injectors to help keep them clean. Also, because fuel is squirted into the intake port on most engines, injector cleaner has the added benefit of preventing carbon buildup on the intake valves. Unfortunately, this doesn’t apply to direct-injected engines where gas is shot right into the combustion chamber. Fuel injector cleaner is able to get rid of gunk and deposits because its made up of detergents. Many formulas use a chemical called polyisobutylene amine (PIBA) that is effective in preventing future buildup of deposits. That said, not all fuel injector cleaners work well – or work at all. Make sure you use a quality product, like those found on this list, to ensure you aren’t wasting your money. When should you use fuel injector cleaner? Many vehicle owners claim to have used a bottle of fuel injector cleaner and had their engine performance problems disappear. And it’s probably true. But all too often, by the time your engine has clogged injectors or carbon built up, it’s too late. That’s why it’s best to start using fuel injector cleaner before performance problems occur. Think of the product as a type of preventative maintenance, like an oil change. You wouldn’t perform an oil change after an engine failure, would you? Any type of routine maintenance should be done both early and often. Just how frequently should you use injector cleaner? The general rule of thumb is every 3,000 miles. An easy way to remember is to add a bottle every time you change your oil. All products are different, however, so it’s best to read the label to know exactly when to add. Ever since the introduction of vehicles that heavily rely on electronics to ensure they operate to maximum efficiency, both gasoline and diesel fuels really took a toll on the efficiency. Especially with the lower octane fuels, pistons, valves, cylinder heads, and the entire combustion chamber, all are seeing a gradual increase in carbon build-up, gunk, and varnish. Sometimes this can result in major problems such as lowered fuel economy, less responsive throttle, rough idle, misfires, knocking, and a host of other problems. Although fuel additives have been around for a few decades now, it wasn’t until recently when cleaners that actually worked quite well, began surfacing to the general public. Liqui Moly Jectron, BG 44K, Royal Purple Max-Clean, Lucas Fuel Treatment, and Chevron Techron. For most of us, cost efficiency is of utmost importance. Using fuel system cleaners over a prolonged period of time can really add up and, in most cases, you’ll need more than one serving of any cleaner to make a noticeable difference in your engine’s carbon build-up. We looked at the potency and the overall cost per serving. While not being the cheapest, the most recommended fuel system cleaners aren’t expensive either. As long as you’re using them appropriately (we will tell you how below), you can maximize their potency. What’s a fuel cleaning additive without the proper potency? After all, that’s what we’re buying them for. With the chart above, every cleaner has exceptionally good satisfaction rating from users, as well as track record of cleaning potency. We will go over the products that offer excellent potency, and also a great value. Low octane fuel (much like junk food), accumulates gunk, varnish, plaque, and carbon deposits. This can trigger the check engine light. Fuel injector cleaning will often time solve the entire problem. Liqui Moly is a German-based company with a wide variety of oil and gas treatments. Although German products tend to cost more than those made in the U.S. and Asia, their Jectron fuel additive is pretty affordable per can, especially when considering its potency strength. A 300 ml can of Liqui Moly Jectron is fairly priced for the value it provides. In addition, if you choose to purchase 6 or more cans of the Jectron fuel additive at a time you can save a few $$. BG is an American based company that originally came from Wichita, Kansas in 1971. Today, they are known for a dozen or so premium products and one of the most potent fuel cleaning products on the market, the BG 44K Fuel System & Injector Cleaner. This is a premium product and so you should expect to pay a little extra here, but once again, you can save some money by purchasing BG 44K in bulk. Royal Purple is an American company that is primarily known for its line of synthetic Royal Purple Motor Oil products. Their products are geared towards being used in high-performance applications and their Max-Clean fuel injector and system cleaner proves it. This product will get your engine 2 times cleaner than the products listed above and at a pretty decent price too. Check it out! Lucas Oil is another American based company you might be familiar with. Their oil supplements and “Quick Transmission Fix” additives are widely used, primarily in the trucking community, on all corners of the globe. It’s very uncommon to find any negative feedback about their oil and fuel additives. When it comes to value for the money, Lucas has taken the win. The fuel system & injector cleaner very competitively priced and comes in a 1-gallon (128 oz) jug. This is enough to treat up to 400 gallons of gasoline and diesel fuel. Chevron is widely known for being a HUGE fuel provider, located in practically every country. The company’s Chevron Techron Fuel System Cleaner is popularly used to clean up carbon deposits left from gasoline fuels. Probably the most affordable product in our top 5 recommendation list, you can grab an entire pack at a very reasonable cost. When an engine’s internal components have less build-up of gunk and varnish, you can expect to see increased horsepower, fuel economy, ride quality, and less electrical problems. Although Liqui Moly was originally designed to be used in higher end German vehicles, you can use Liqui Moly in practically any vehicle that runs on gasoline. 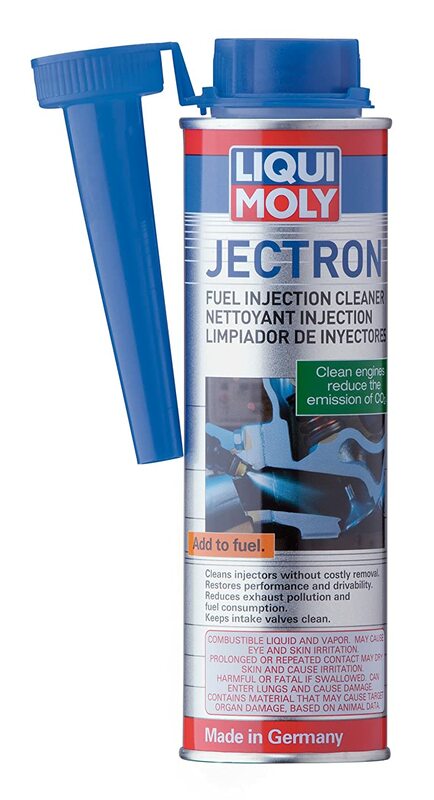 Liqui Moly’s Jectron cleaner has an excellent potency that tackles the most common problems such as rough idle, decreased fuel economy, heavy carbon build-up and a host of other problems caused by low octane fuel. Jectron is a great tool to tackle medium to heavy deposit build up. 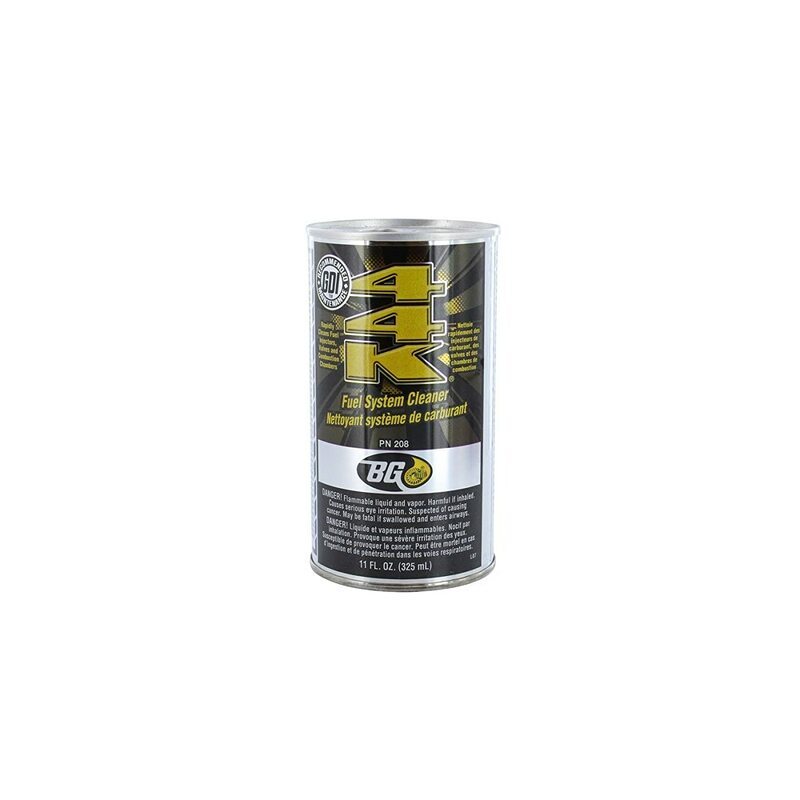 As we mentioned above, BB 44K isn’t the most affordable fuel system cleaner on the market, but it doesn’t go without saying that BB 44K isn’t one to be taken lightly. This is a great system cleaner to tackle medium to heavy deposit build up and the power it has to eat away at varnish and carbon is quite impressive. Royal Purple Max-Clean is a great fuel system cleaner to eat away all the crud that low octane fuel has left behind. One 20 oz serving of this cleaner can get your vehicle back to clean running fuel injectors and can greatly reduce (or eliminate) carbon build-up. It may take a few treatments, but you can expect overall improvements in fuel economy, horse power, emissions, idle, spark know, hesitation in acceleration and fuel stabilization. Whether you have a 2-stroke engine or 4-stroke engines, you can expect to see these benefits after using Royal Purple’s Max-Clean. Lucas fuel system cleaner is the most value packed fuel additive on our list and for good reason, too. With an exceptionally high satisfaction rate, you can guess that this fuel system cleaner makes a difference. 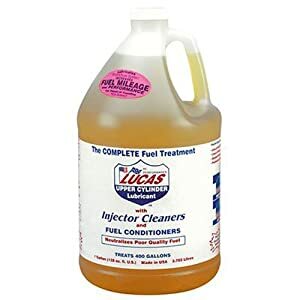 In addition to eating away at the nasty build up from burnt up fuel, Lucas’ formula was also created to clean and lubricate the entire fuel operation (including piston rings). You can expect increased fuel economy, ride quality and engine life expectancy when you use it appropriately. Plus, you can clean up to 400 gallons of gasoline or diesel fuel with one gallon of Lucas’ Fuel System Cleaner. One serving of a lot of the other cleaners will only be good for a couple tank fulls. Chevron products have a lot of fans and supporters. Chevron Techron Fuel System Cleaner is formulated to work with gasoline engines and has been known to restore power, acceleration and fuel economy as well as reduce and eliminate rough idle, knocking and finally give the engine an easier way to operate. When it comes to finding the best of the best, it’s not necessarily easy to say “oh, this one is the best… out of hundreds of others on the market”. However, after testing and comparing to see what others have experience with their vehicles, the best cleaning potency you can buy right now (without spending too much), is the Liqui Moly Jectron Fuel System & Injector Cleaner. Now, with that being said, if you’re looking for the absolute best bang for the buck, Lucas Fuel Treatment is the way to go. Strong potency is one thing, but getting 1 whole gallon of cleaner for less than 40 dollars a totally different thing. The products on this list are the very best on the market. Here are some testimonials from people who have actually used these product. Don said, “This stuff definitely makes a difference. I used it in all my families cars and you can feel a difference in the engines performance right away. So, what are you waiting for? Show your car some love by ordering a bottle of fuel injector cleaner today. Overall, fuel injector cleaners make a BIG difference when an engine has all the other aspects running smoothly. If you like the fuel injector guide above, you’ll also enjoy our Spark Plugs Buyers Guide, Engine Air Filter, Oil Filters Buyers Guide, Motor Oil Buyers Guide, and OBD2 Scanner Buyers Guide. Read up on each one, you can drastically increase the life of your vehicle.